Are flying robots the future of real estate? Real estate companies chomping at the bit to incorporate drone (robotic flying camera) photography into their marketing, and they may be a step closer to their goal. The Federal Aviation Administration, which has banned the commercial use of drones, recently made an exemption to rule. 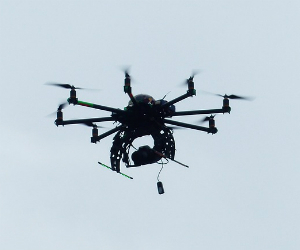 The agency announced Thursday that it will authorize six filmmaking companies to use the unmanned aircraft for their work on commercial movie and TV sets. The FAA determined that filming with drones on a closed production set is legal, as long as filmmakers can prove it is safe. Now that the FAA is easing up, will the authorization of drones for real estate use be soon to follow? NAR said it had sent a letter to the FAA asking the agency to consider permitting the use of drones in real estate, arguing that the technology does not pose a threat to public safety. Real estate agents were using the robotic flying cameras to film bird’s-eye-view video tours of homes, land and commercial properties. "Realtors are showing tremendous interest and enthusiasm for new drone technologies that could help them market listings in an efficient and environmentally sensible manner," NAR said in its letter to the FAA. NAR added that safety and privacy worries are a primary concern to the organization, but its members are also concerned with how the FAA’s policy hinders the growth of many industries. Earlier this month, the FAA invited the National Association of Realtors to join its group that addresses the use of drones or unmanned aerial systems. NAR will help the agency craft regulations for safe and responsible commercial use of the technology. The FAA has said new drone rules will take time because of the complex safety issues raised by thousands of new vehicles using the nation's airspace. The FAA’s decided to ban drones for commercial use in 2007. The FAA is slated to announce the proposed rules by November, according to NAR.